Scots employees have revealed what they think are the top most socially awkward situations that inevitably happen in the workplace. The poll comes as part of the British Heart Foundation Scotland’s new Raise Funds Your Way campaign which aims to get workplaces fundraising to fight heart disease. No matter where you are employed there is always going to be an uncomfortable moment that you just can’t escape from. From mild mishaps to extremely embarrassing encounters, the BHF Scotland poll has revealed what ranked highest in the list of the most cringe-worthy office situations. Over a fifth of workers said making small talk by the tea point or when queuing for the microwave is at the top of the list. This was followed by spilling something down you before an important meeting. Not knowing what to say to a colleague on the commute home from work came in third (17 per cent) followed by not knowing whether to say hello to a colleague in the toilets (15 per cent). Some of these awkward encounters might be explained by the fact that over a third of people surveyed confessed they don’t know the names of some of their colleagues (31 per cent) and were guilty of not knowing what many of their fellow employees actually do (21 per cent). The poll revealed some workers even go to extraordinary lengths to avoid uneasy situations with colleagues by taking a different lift, eating their lunch at their desk or even taking an entirely different route home from work. BHF Scotland is calling on workers across Scotland to avoid these socially awkward situations and get to know their colleagues better by holding a fundraising event at work and raising funds your way for life saving research. Nearly two fifths of those questioned said fundraising in the workplace was a great way to break down barriers (39 per cent) and get to know colleagues, while 36 per cent said it helps to boost staff morale. 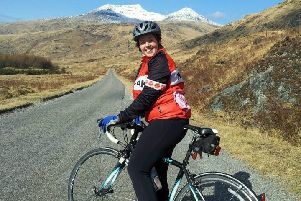 Barbara Osborne, head of community fundraising at BHF Scotland, said: “We’ve all had to endure those uncomfortable everyday work moments where you just don’t know what to do or say in front of your colleagues. BHF Scotland urgently needs more people across Scotland to organise their own fundraising events to help fund heart research that will change the lives of those living with these devastating conditions.